Players will get a VR mode that Murray said is entirely compatible with existing saves. Players will get the ability to interact with the world from the first-person perspective of their character in the game. Players will be able to do cool things like walk through the bases they’ve made and pilot their spaceship using virtual throttles and joysticks. “Hi, it’s Sean,” is what I heard after I was playing for a couple of minutes. I suddenly realised Sean Murray had walked over to chat. How convenient! You just play this game in VR and suddenly Sean Murray is next to you. No Man’s Sky VR is meant to be a magnificent option for the game’s players. It doesn’t technically add anything to what you can do in the game, just changes how you do it and how it appears. From the 20 or so minutes I played of the game in VR, I was struck by the sense of presence I had in the world and my appreciation of its scale. Now you’re deep in a cave looking up as you try to tunnel out. Now you’re standing inside the base someone made. Now you’re talking to an alien who appears to be in front of you. It also poses some nausea risks. 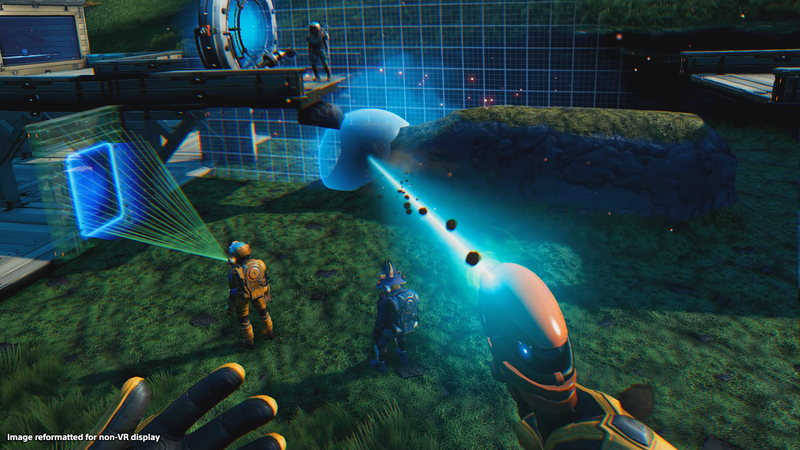 The developers at Hello Games are offering a range of movement options, including a teleport-and-turn system for moving through the world and stuttered rotational turning, which tends to diminish the risk of feeling sick in a VR game’s 3D world. 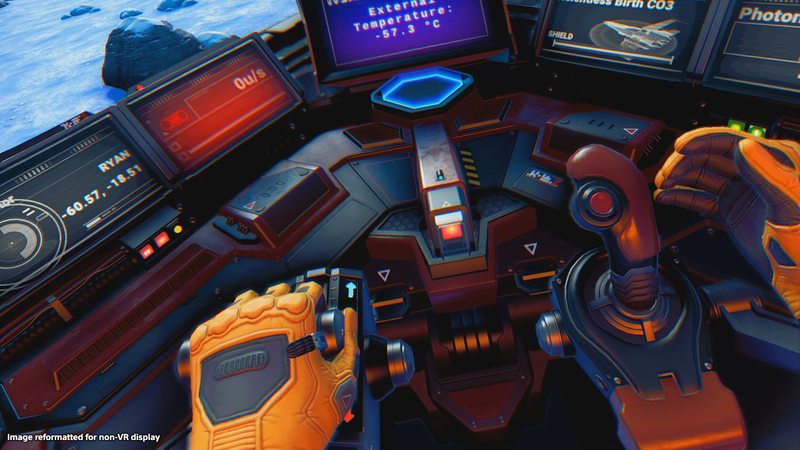 Murray still cautioned that some moments during a spaceship flight might be hard for some players to take in and that the game will offer a range of comfort settings there, too. I did not feel queasy when I played, not even during my brief moments flying a spaceship. You can summon your ship from a wrist menu and then climb into a cockpit to see controls that are represented as objects you can interact with. In the ship I entered I could grab a horizontal throttle with my left hand. With my right, I could hold a joystick. Pushing the throttle up and pulling the stick back made me take off. I flew briefly. As I took off, Murray warily suggested I look around out of my cockpit, noting that I should only do that if I felt well enough. I did. It’s smart to offer VR as an option for the game and to let players use their existing saves. Long-term players, Murray mused, will see their in-game creations and familiar planets in a whole amazing new way. It seems worth trying if players have a VR headset. 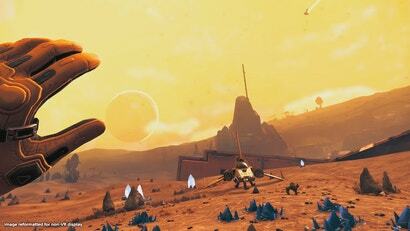 Players should just be sure it’s comfortable for them and that, when it’s time to punch a rock or open a cockpit, that no one, not even Sean Murray, is within striking distance. I chuckled at the thought of Murray getting smacked about repeatedly, the universe demands balance!! Seriously though, is this gonna cost? I've already paid full price, got a refund and then repurchased for $25 last year, I don't really intend to spend any more on it. when the VR mode comes to PS4 and PC as part of this summer’s free Beyond update. Thanks man, I did look for a bit and must have missed it. You spent $25. With all these free updates I think you're winning. It has nothing to do with what I feel I'm entitled to get either, I feel its something they had to do as a company. On a positive note I like that they are going for multiple control schemes. I can not wait for this! The fact that I can load up my save which I've been using since day 1 is super exciting. I really hope they announce the release date soon, but I'm guessing that may come with the announcement of the third part of the update. I'm hoping it's early summer...and so thankful it's the northern hemisphere's summer and not ours. Hopefully, this big update will also provide fixes for peforcme issues that people have been getting with the mission system. Don't care either way to be honest, but a) I have that headset sitting there unused, and b) am interested in how far their VR support goes. Main worry is the reference to Steam VR. Does that mean its only going to be an option on the Steam version, or does that Steam VR support extend to all copies. Additional to that, will that Steam VR support work for all VR headsets, or a specific group?